Q: What happens when Firefox crashes? A: You lose all the pages you had opened. 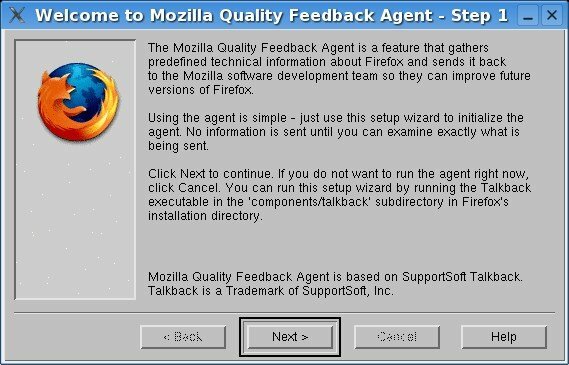 Well, I’ve seen a lot of those Mozilla Quality Feedback Agent back on Windows 98. Since I switched completely to Linux in february this year, I haven’t had a single one. I even forgot it exists. Now, look at that uglyness. It looks like it is not using Gtk, but rather like some TCL/Tk or even Xlib application. I hated the dialog on Windows - but this one is funny. It also ask about website I was visiting. Well, hard to remember as it was a Google search result, and the exact search term was … hm, can’t remember, but History will refresh my mind. Good thing history is saved before program exit. Well, FF has to have it’s own BSOD, otherwise it wouldn’t be considered serious software.